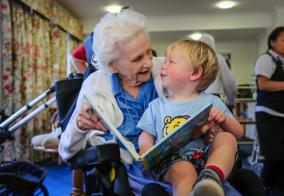 “Get out the way, I can’t see their faces” 94 year old Sheila has been living at Abbotts Barton Care Home for the last 3 years and this was the first time that a group of toddlers had been invited in to meet the residents. Up until this moment, the care assistants had been unaware that Sheila had been a nursery nurse, or that another resident had been a school teacher; the sight of the children sitting on the carpet, had taken them back to a forgotten world. Once everyone was sitting comfortably, the music began and what followed was very moving. Still watching like a hawk, Sheila began copying a toddler who was playing on his tambourine as loudly as he could. Other residents were shaking their bells, rocking in their chairs, and singing at the top of their voices. As the session reached its final crescendo, the children were thoroughly enjoying their appreciative audience and it was hard to tell who was having the most fun. As always at Monkey Music, the session ended quietly with lullabies, hugs and bubbles. Except, this time, there was extra time given for sharing a little more precious time. For Sheila, this was having a special moment with her favourite tambourine playing little boy, who had settled on her lap whilst she read him Monkey’s book. Before our visit to Abbotts Barton, I couldn’t have foreseen the intoxicating effect of music and children. It is a bit of a cliché, but the power of music is extraordinary and it does bring everyone together no matter how young or old.